Valve has revealed its plans to deal with the thorny issue of 'Review Bombing'. The company was already planning to implement changes to its user review system, to make it more useful for those looking for games on which to splash their hard earned cash, but Review Bombing became a hot topic in the meantime. Valve considers Review Bombing as a source of distortion in a game's score / review quality. However it notes that most games, in general, recover from the bombing damage. "Review bombing is where players post a large number of reviews in a very compressed time frame, aimed at lowering the Review Score of a game. At the same time, they upvote each other's reviews and downvote all the other reviews." Valve has user reviews which are available in summary, expandable in full, and contribute to an overall satisfaction rating for a game. The reviews themselves are reviewable to some degree, with other Steam users able to indicate whether they are helpful / unhelpful, or funny. For an example you can ponder over the reviews of the recently released Dishonored: Death of the Outsider game (scroll down for customer reviews section). The purpose of the review section, according to Valve is "to provide a potential purchaser with an estimate of how likely it is that they'll be happy with that purchase". So what is the problem with Review Bombing? If a certain group of people don't like a game, why can't they get together to criticise it and support each others' views? Valve thinks some of these developer / customer feuds are irrelevant to new would-be gaming purchasers. For example, a game can be negatively reviewed due to things like: "something the developer has said online, or about choices the developer has made in the Steam version of their game relative to other platforms, or simply that they don't like the developer's political convictions". 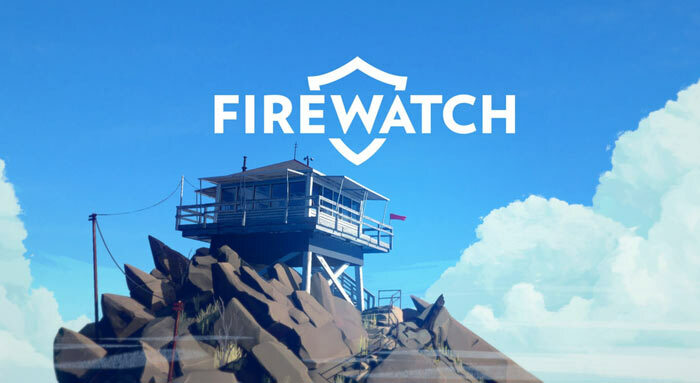 A recent high profile Review Bombing case revolved around a spat between a Firewatch developer and PewDiePie - nothing to do with 'gameplay'. Often after a Review Bomb a game score regains its former heights, this is seen as a developer acting to remedy problems / issues with a game that have caused unhappiness in the community. Usually that's the case as this is business after all, and long term thinking is usually the best strategy. Valve considered a number of things which could minimise Review Bomb impacts. It thought about suspending reviews for a period if such activity is detected, also it pondered over review score weights. It came to the conclusion that such measures were too strong and instead decided to share more data with end users. 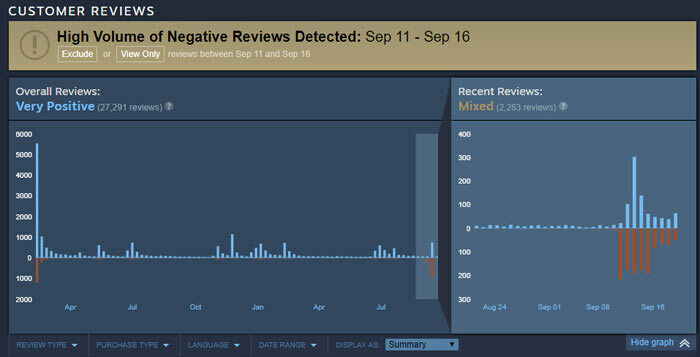 What Steam gamers will get as a result is a view of the positive to negative review timeline displayed as a histogram (example above). Valve reckons this gives would-be purchasers the opportunity to "spot temporary distortions in the reviews, to investigate why that distortion occurred, and decide for yourself whether it's something you care about." That sounds rather sensible, democratic, and unobtrusive - no blocking or limiting user behaviour, just more data for people to make clear purchasing decisions. Valve will continue to monitor its user reviews and the community conversations around them. Excellent idea by Valve. Don't bother screening them out with all the potential for “you're taking the side of X” or getting involved in politics, just give the user the information and trust them to be educated and intelligent enough to interpret the data and decide if they care. I think this approach is very sensible, saving Valve a lot of headaches whilst unveiling review “bombs” done on grounds other than gameplay. 100% agree i was expecting them to filter or limit reviews in some way but this is actually a really good solution. TBH, I never pay attention to reviews that much. Same for films, as 100 reviewers might all give a film 9/10, but all scoring it on totally different aspects, none of which are the actual plot anyway. I mostly read through some of the negative reviews to see what kind of game-breaking bugs there might be, and that's it. The rest is so subjecitve as to whether their idea of a good game matches my own, that I'm motivated more by how it looks in the trailers/gameplay vids and whether it's cheap enough to risk a couple quid on or looks good enough to justify the several quid they're asking for it. Well… Firewatch and Sean Vanaman‏ can get lost. Unless you've been living under a rock or ignore youtube you know what it's about. As soon as I read the headline I knew which game this was about. Sean wants free speech, obviously, so people are FREE to leave negative reviews if they so feel the need. I bet Sean, as well as his team, have been loudly protesting to valve. Maybe Sean can apologise just like Pewdiepie did?